Last month, payroll employment levels in the U.S increased by 214,000, as the nation’s unemployment rate edged down to 5.8 percent. At least some commentators were surprised that these labor market gains left the electorate unimpressed. Stronger GDP reports in 2014-III, a booming equities market and continued low interest rates, combined with falling gas prices, suggested that economic conditions were trending in the right direction for Democrats. Yet the Real Clear Politics average of polling measures of President Obama’s handling of economic matters found a negative impression among respondents, with 54 percent disapproving of his economic performance and just 41 percent approving — a negative spread of 13 percentage points. Placing these job creation numbers in an historic context and examining some of the data at the state level might help us understand some of the sources of continued dissatisfaction with job market conditions in the country. Since the beginning of the year, the nation has added nearly 2.3 million jobs and is on pace for an annual average gain in payroll employment levels of about 1.9 percent for the year. This rate of new job creation certainly represents an improvement since the beginning of the recovery, but it is a modest rebound compared to previous economic recoveries. For example, back in 1983–1984 the nation added about 3.6 million jobs a year, a torrid four percent annual rate of job growth. Similarly, over an extended 1993–1998 period of economic rebound, employment increased by more than three million jobs a year growing at an annual pace of 2.8 percent. The current recovery looks more on pace with the so-called ‘jobless’ recovery of 2004–2006 where the annual pace of new job creation was just 1.7 percent. But another reason for the public’s less-than-rosy view of the economy is the great geographic unevenness in the jobs recovery; some states have experienced a very strong rebound from the losses incurred during the Great Recession, while others have yet to claw back enough jobs to reach their pre-recession employment levels. 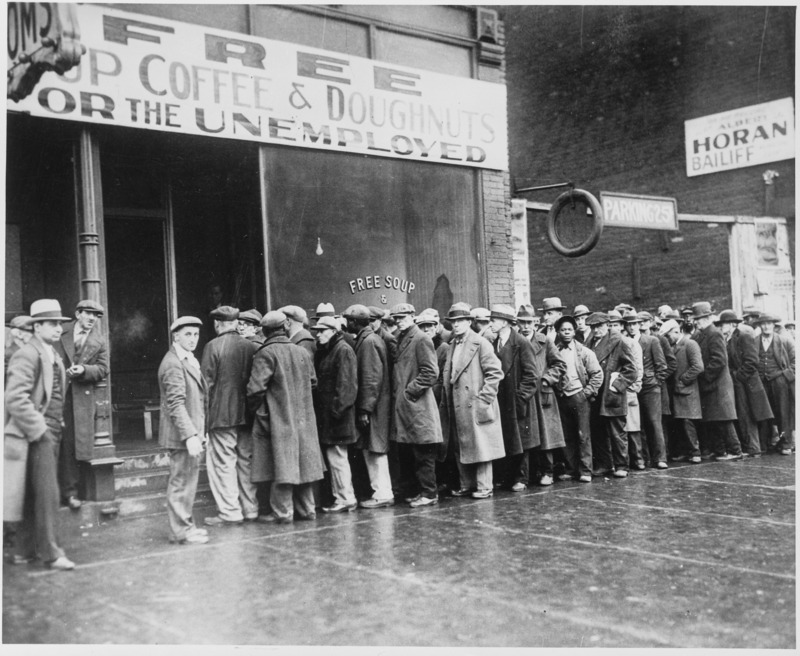 The nation lost 8.7 million jobs during the recession and did not get back those jobs until May of this year. By October, we had recovered a total of 10 million jobs so the national ratio of jobs gained to jobs lost over the Great Recession is 1.15, that is for every 100 jobs lost in the downturn the country recovered 115 jobs through today. However, there are 24 states around the nation who are still underwater on this measure of labor market strength, with fewer jobs gained in the recovery compared to jobs lost during the recession. Many of the states that lost a lot of jobs — especially in the Rocky Mountain region have had very poor recoveries — Arizona, Nevada and New Mexico have recovered only between one-third and two-thirds of the jobs lost in the downturn. States in the Northeast, including Pennsylvania and Maryland, have yet to recover all the employment lost during the downturn. In contrast, a number of states are booming. Texas has added more than 1.4 million jobs since 2010, while losing fewer than 300,000 jobs during preceding years of the economic downturn. North Dakota, South Dakota, Nebraska, Minnesota and the Upper Plains states in general, heading south to Louisiana, have all experienced rapid job growth and are all above water. While much of the Northeast has struggled in job creation in recent years, New York stands out as a major exception. New York has added more than two jobs for every job lost during the downturn, with payroll employment growing by 550,000 over the recovery. New York state has shown particular job creation strength at both ends of the education/skills spectrum. The professional, scientific and technical industry — that includes high-powered business, finance and accounting consulting firms as well as engineering and scientific research companies — have added more than 80,000 jobs, which is a very robust 15 percent gain since 2010. At the other end of the skill spectrum, the state has posted gains of nearly 140,000 new jobs, a 19 percent rise in its leisure and hospitality industries with most of that gain coming from accommodation and food services companies. Unfortunately, New York has seen sizable geographic imbalances in this recovery. Of the 550,000 jobs added over the recovery in New York state, 70 percent occurred in New York City proper with the city’s payroll employment levels expanding by 10.4 percent, a pace that is nearly three times the pace of new job generation in the rest of the state. Similar geographic imbalances in job creation can be found within California. While the state’s overall recovery was quite strong-with a recovery ratio revealing that Cali got back 183 jobs for every 100 lost during the downturn; yet large parts of Southern California have been left behind. The number of jobs located in the Metropolitan Los Angeles-Long Beach areas remains about 50,000 jobs below its pre-recession peak. Meanwhile, Metropolitan San Francisco’s job market is quite robust, adding 168,000 more jobs since its pre-recession peak — adding 256 jobs during the current recovery for every 100 jobs lost during the recession compared to the Los Angeles-Long Beach area whose labor markets remain underwater. It seems that a new economic geography is emerging, with winners and losers increasingly tied to specific geographic regions of the nation. 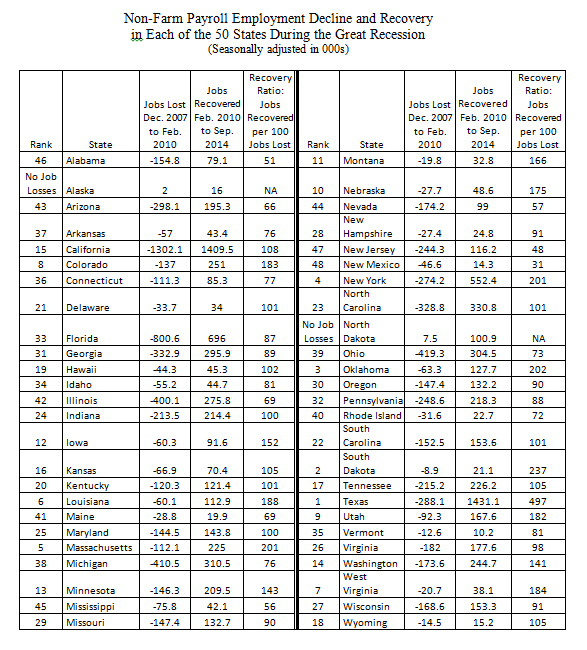 The table below presents state by state results on the pace of the jobs recovery over the entire Great Recession cycle. The columns labeled “Jobs Lost” are the measure of non-agricultural wage and salary employment decline in each state during the ‘jobs recession’ that lasted between Dec. 2007 and Feb. 2010. The columns labeled “Jobs Recovered” are the measure of non-agricultural wage and salary employment gains in each state between Feb. 2010 and Sep. 2014. By Neeta Fogg and Paul Harrington, labor market economists in the Center for Labor Markets and Policy at Drexel University. Follow the Center on Twitter at http://www.twitter.com/clmpdrexel. Members of the news media who are interested in speaking further with Fogg or Harrington, can contact Alex McKechnie at ahm62@drexel.edu or 215-895-2705.